" Thanks for all of your help... We'll certainly recommend your company to anyone I hear of looking for signs! " We are committed to providing our clients with professional sign letters and other high quality lettering products with courteous service from our knowledgeable staff. Okay, No. We don't come to your building to install your sign products, but we will be here to assist your installers. 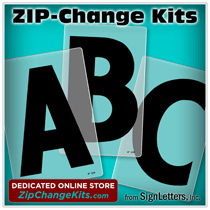 Our sign letters are fairly easy to install on your building, using our spacing templates or drilling patterns. When its time to install your signage, just give us a call if you need some pointers. We're here to help! Look here for tips.